I believe in upgrading freight and passengers cars to metal wheels for improved tracking. The metal wheels don't pick up dirt and crud as quickly as plastic wheels, roll better, add weight at the lowest point possible and improve overall performance. I upgrade even cheap freight cars. Recently I was upgrading some cheap freight cars for our Nottawasaga Model Railway Club that had been picked up at our annual auction. Here are tips and techniques I've learned over the years. Freight cars usually have 33" wheels and passenger cars have 36" wheels. There are also 28" wheels for some equipment and larger diameter wheels on some modern rolling stock, but for the most part, the freight cars the typical model railroad hobbyist uses have 33" wheels. Companies that make replacement wheels include Walthers Proto 2000 and TrueLine trains. The styles and axle ends vary. Many of the cheap cars with plastic wheelsets have oversize flanges and plastic axles that tend to bend and warp. It is often impossible to regauge them. The holes for the axle ends may not accept the replacement axle ends. 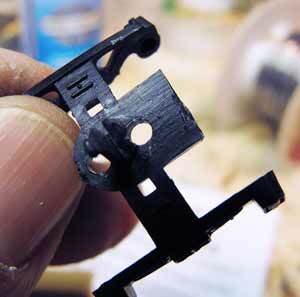 Sometimes it is only a matter of reaming out the holes with Micro-Mark's HO truck tuner (#82838). This is handy little tool I highly recommend for tuning up model railroad trucks. Sometimes the plastic trucks wobble and can't be adjusted. 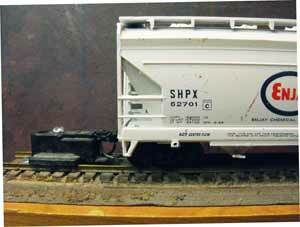 That was the problem with the plastics freight car I was trying to upgrade by replacing wheels. I couldn't simply install a new set of trucks with a standard 2-56 screw because the hole for the snap-in trucks was too wide. If you face the problem, here's a way to solve it. Find a sprue in your scrap box that is slightly larger than the hole in the freight car's bolster. Roughly cut it to size with an X-Acto knife or other sharp blade and then get it as round as possible with a file or sanding block. I use an emory board to finish the shaping. It doesn't have to be exact but make it as close as you can when replacing wheels. After I have shaped the sprue I plug it into the bolster hole and secure it with a plastic liquid glue such as Tenax or Ambroid. Then when the glue has set I clip off the protrusion with rail nippers and file down the plug until it is flat before the final steps of replacing wheels. I have found that the hole in the bolster doesn't have to be completely in the centre of the plug. There's a little leeway. However, drilling it as vertical as possible is important to avoid the car leaning to one side or the other. 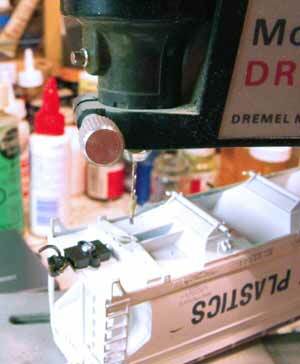 I use a Dremel drill stand. I start bt drilling a pilot hole with a #56 drill bit. 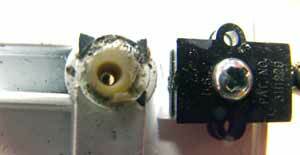 It is important to drill slowly because the drill bit will melt the plastic and it will adhere to the drill bit. I clean it off with a knife. Then I change drill bits and go down to a #53. This is slightly undersize for the screw. 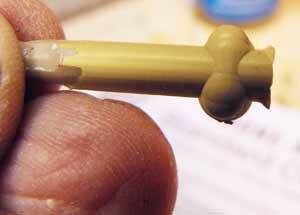 It is commonly used for drilling and tapping for a #72 screw. 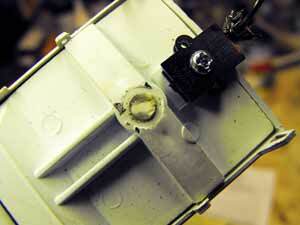 However, the hole will end up slightly larger due to the plastic melting. I finish by tapping for a 2-56 screw. This is the common size for HO trucks and is available from Micro-Mark, Athearn and others. Now it is a matter of adjusting the coupler height when replacing wheels. I don't tighten the 2-56 screw all the way, only enough to hold the trucks in place while I turn the car over and place it on the test track. I prefer the original Kadee metal couplers. It may be necessary to add a styrene shim underneath the coupler box to get it to the correct height and horizontal to the track. Sometimes you can use the original coupler boxes. On this particular car I had to add a shim and drill and tap for a 2-56 screw. Depending on how much the bolster has been filed down there is the option of using Kadee washers to raise the car. Kadee also makes coupler box shims that are flat versions of the boxes. Kadee also make lots of variations to solve problems like close-coupling of engines and passenger cars, high and low mounting platforms and tank car platforms. Often the simplest solution to adjust coupler height when replacing wheels is to use a Kadee #22 medium overset shank or a #27 medium underset shank. They also sell short and long shanks. I keep a set of all their coupler variations in a drawer so I can figure out what will work best. In most instances the #5 will work. In this case it didn't. On one end of the freight car I had to use an underset shank and washers on the other end. Finally I tightened the bolster screws, put the cars in a train and ran them around the layout to make sure they were tracking correctly. I added a little weathering with Pan Pastel powders to get them ready for service at the club. Painting masks are available that slip behind the wheels on the trucks should you wish to spray paint them. When changing wheel sets is a good time to paint them. Don't be afraid to tackle replacing wheels on your HO rolling stock. Pick up a few cheap plastic cars at the next train show you attend and use them for practice. It's an inexpensive way to increase the size of your fleet and reduce the number of derailments. Return from "replacing-wheels" to the rolling stock overview page. Go from "replacing-wheels" to the couplers overview page. Return from "replacing-wheels" to my Home Page.